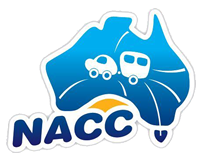 Every three years caravan clubs that are registered with The National Association of Caravan Clubs, meet at a National Caravan Clubs Rally organised by the host state. The Rallies are usually held over a period of ten days. Initially National Rallies were organised by the individual State Associations of Caravan Clubs. The first National Rally was held in 1970-71 at Mildura and was organised by the Caravan Club of South Australia. Since then National Rallies have been held every three years on a rotational basis with all states except Tasmania and the Northern Territory having hosted at least one rally. Each National Rally involves a significant amount of planning and organising. In most instances, this planning commences six years prior to an event. National Rallies have been traditionally held over the Christmas New Year period but the rules have now been relaxed so that the organising State can set the dates according to the most suitable period for such a major event. Notice that the 15th and 16th National Rallies have set September as the most suitable time to hold the event. Over the years the National Rallies have been hosts to visiting caravanners from New Zealand, the United Kingdom, France, America, Japan and Asia.